Getting married is cool; getting the narrator from Baston to narrate your nuptials is cooler. If you've been to the altar, you know how recent groom Jay Greschner probably felt: somewhat exhilarated, and somewhat terrified. Wouldn't saying "I do" be much easier if you had a calm, reassuring voice narrating the wedding's pivotal events as they happened? 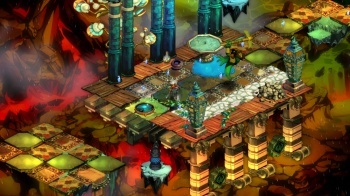 Greschner, after writing an impassioned email to Bastion developer Supergiant Games, got just that. Logan Cunningham, the game's narrator, recorded a set of unique voice clips for Greschner's ceremony - a huge, but welcome, surprise for the unsuspecting bride. Greg Kasavin, the game's lead writer and creative director, received Greschner's e-mail and replied right away. Although Greschner included a number of sample lines in his email, Kasavin explained that the Narrator had a reputation to uphold, and offered to do the writing himself. Greschner accepted, and Kasavin and Cunningham recorded four brand-new lines just for Grescher and his fiancÃ©e, Hayley Watson. During the ceremony, Greschner entrusted his brother with playing the clips at predetermined points. True to form, Cunningham's clips narrated the action as it was taking place, whether he was describing the bride walking down the aisle, the couple's marital kiss, or the auspicious absence of cell phone noises. While some brides might view any deviation from their planned wedding as grounds for an early divorce, Watson loved Cunningham's low-key, cool-as-ice performance. "[Things] went off without a hitch and the custom recordings from the Narrator completely floored my wife," said Greschner. Mr. and Mrs. Greschner are now happily married, with a little help from a game company that cares about both its products and its fans. We wish them the best, and hope that they get to spend lots of time together before that pesky Calamity destroys the world.